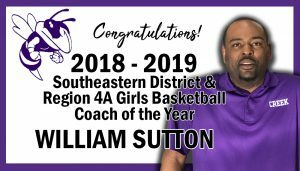 Congratulations to Coach William Sutton from Deep Creek High School! Coach Sutton was named the 2018-2019 Southeastern District and the Region 4A Girls Basketball Coach of the Year. Sutton led the Deep Creek Hornets to the state semi-final game this year.